The program Smart*light was funded by Interreg Vlaanderen-Nederland. The research project Smart*Light develops a compact and portable X-ray source with variable wavelength, a ‘tabletop synchrotron’. A consortium of 12 organizations in The Netherlands and Flandres receives a subsidy of 2,85M Euros from the European Regional Development Fund (Interreg Flandres – The Netherlands). Smart*Light will eventually be used in clinical applications for medical diagnostics, in research laboratories for developing new materials and in museums to investigate important art works. Screening a person on breast cancer, inspecting welds in pipelines, examining the chemical condition of art works, it is still carried out by using ‘classical’ X-ray technology developed in the 19th century. These x-rays, however, mostly have a low intensity and can hardly be adjusted, which often results in snapshots with insufficient resolution. For advanced applications, such as the development of high-tech materials or new medicines, ‘coherent’ high-intensity X-rays are indispensable. Nowadays, this type of radiation is only produced in synchrotrons, large accelerators in which electrons move at nearly the speed of light in pipelines of several kilometers length. By using synchrotron radiation changes in materials and tissue can be mapped very accurately in terms of location and time. However, the poor availability of high-energy synchrotron radiation puts serious limits to the experimental possibilities. In many cases travelling to synchrotron facilities (all located outside the Benelux) is unfeasible. Smart*Light uses new accelerator technology to convert laser light into intense and coherent X-radiation by means of collisions (by ‘inverse Compton scattering’) with a high-energetic beam of electrons. This radiation enables state-of-the-art analysis that can be valuable for various public and private sectors. Although Smart*Light will not aim at replacing existing synchrotron facilities, it will provide a valuable addition due to its compact design. As a consequence, users will be less dependent on the scarce experimental time slots at large synchrotrons. In particular the high mobility of the system provides an important benefit: the complete set-up will have a length of less than 4 meters and therefore, will be widely applicable. For instance, the system can be placed next to a complex set-up instead of vice versa. This way, the relationship between process conditions, microstructure and material properties can be better investigated. This simplifies the development of new materials, leading to e.g. improved prevention of fatigue and corrosion in vessels or a wider range of applications of 3D-printed materials. In the near future, Smart*Light offers unique opportunities for medical diagnostics in hospitals and for research into top art works from e.g. Rubens, Vermeer and Brueghel in museums. It opens up the opportunity to analyze the chemical composition of paintings layer by layer, which is not only important for the preservation of art work but also for authenticity research. In the project a variety of universities, companies, museums and research institutes cooperate in different scientific areas. 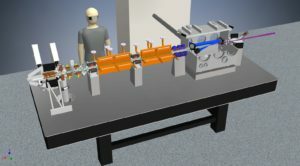 The development of the X-ray source occurs at Eindhoven University of Technology, whereas the universities of Antwerp and Ghent will be developing the detection techniques like X-ray diffraction, fluorescence and tomography. Delft University of Technology will mainly focus on the functionality of the system for research into materials and art work. Other partners are: VDL ETG BV, Agfa Healthcare, Erasmus MC, Stichting tot Beheer Museum Boijmans van Beuningen, TI-COAST, XRE NV, Koninklijk Museum voor Schone Kunsten Antwerpen, and Stichting Materials Innovation Institute (M2i). TU Delft (MSE group at the faculty 3ME) acts as the secretary of Smart*Light. Interreg Flandres – The Netherlands subsidizes collaborative projects for smart, green and inclusive growth. The transboundary character in an Interreg project is crucial: intensive collaboration occurs on both sides of the boundary, whereas all partners provide additional co-financing. Interreg is financed by the European Regional Development Fund. Read more on the Interreg website.